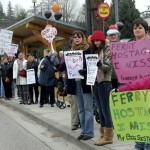 “The decision by the British Columbia Liberal government and the BC Ferry Corp. to slash services on many so‑called `minor routes’, and to eliminate free sailings during Monday to Thursday each week for seniors, will cause enormous hardships to the people of this province, while bringing paltry benefits to taxpayers. In fact, these cutbacks will likely create economic losses far outweighing the supposed savings which are the justification for this announcement. “We join with groups and individuals across British Columbia demanding the cancellation of these changes. In our view, the coastal and inland ferry system of BC must be treated as an extension of the highway system, i.e. as an essential public service for the people of this province, not as a `for sale’ operation geared to squeeze a profit out of each route. As with the highway system, residents of British Columbia have historically made important life decisions about where to seek employment and to live, based largely on access to regular, reliable, affordable transportation routes. For decades, working people in this province have contributed to the economy through their employment in a wide range of industries along the coast, depending on the ferries to get to work, school, and community facilities. “This remains true today, even when some industries have shrunk, especially as the importance of tourism becomes more significant. It is particularly unfair and unjust to treat coastal residents in this way, by imposing cuts which will have huge consequences on their communities, all for the sake of arbitrary budget decisions. “These cuts will severely impact the ability of residents of many communities to get to crucial medical appointments within one day, or to send sports teams or cultural groups to other communities. The cuts will further devastate the tourism sector on Vancouver Island and other coastal regions, which already suffer from reduced numbers of visitors due to skyrocketing ferry rates. And to add insult to injury, the cuts are being imposed by a top‑heavy BC Ferries bureaucracy, loaded with high‑paid managers. “The latest announcements are an ominous signal to the workforce at BC Ferries, who can expect layoffs and a determined corporate/government attack on their wages and working conditions in the next round of collective bargaining. The Liberal government is gearing up for a push to convince the public that the hard‑working, skilled workforce of BC Ferries, those with serious responsibilities to transport passengers, vehicles and goods safely under all types of conditions, are somehow the cause of the system’s financial problems. The real truth is that the economic losses of BC Ferries are mainly caused by the decline in passenger numbers following years of sharp rate increases. Communist Party Condemns Attack on Canada Post Hands Off Syria: Keep up anti-war actions!